Prime time debate on TV was all about analysing colours of Ranveer-Deepika’s wedding dresses. Thursday, prime time: the NewsX anchor was grave and chose his words carefully, lest he fails to address this matter of critical, national importance with the right degree of seriousness. Tell me, he asked his special invitee, ‘your thoughts’ on the ‘palette’ of colours – white, cream and pink – in Deepika and Ranveer’s wedding ensembles? She wasn’t the only one. Television news reporters had fallen in love – and practically fallen off the boat as some strained to catch a glimpse of Deepika Padukone and Ranveer Singh’s wedding – or at least the green, green hills of the wedding venue. So much so, that our light-hearted prediction actually came true: the #DeepVeerWedding became the ‘Burning’ topic of discussion on several news channels, beating out the ‘super sensational’ ‘#Plot to Kill Modi’ (Times Now), musician T.M. Krishna’s cancelled performance in Delhi (India Today), ‘#ItalyKeSaudagar’ (Republic) and S. Gurumurthy’s thoughts on the RBI (CNN News 18). For approximately an hour, for reasons best known to him, the NewsX anchor persistently asked his guests and reporters to read meanings into the colour combination worn by Deepika and Ranveer – Huh? At 8.30 pm, Republic TV was in the middle of Yogi Adityanath’s scathing ‘Saudagar’ attack on the Gandhis when ‘Breaking News’ interrupted his Italian diatribe with a ‘Special Broadcast’: straight from Lake Como in Italy (where else? 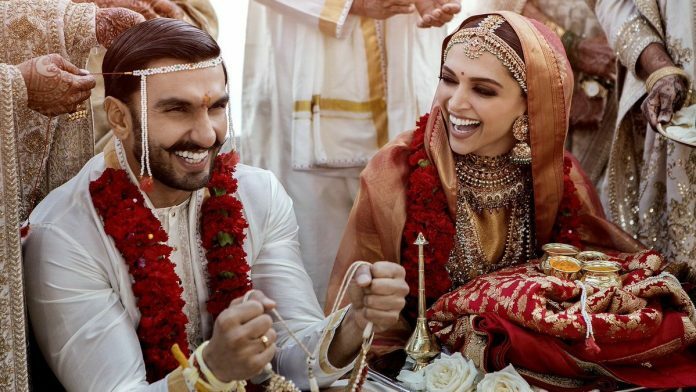 ), ‘first pictures’ of the wedding – or rather Deepika and Ranveer having a good laugh (at our expense? ), dressed in their, yes, ‘love’ly pink-and-white Sabyasachi clothes. The same pictures, uploaded by the couple on social media, were also ‘breaking first’ on NewsX, Mirror Now, CNN News18, among other news channels. Meanwhile, the ABP anchor at 9 pm was mildly annoyed why, oh why, had the photos been released just before Masterstroke, the in-depth news feature show? Downright inconsiderate of Deep-Veer? Now, what should she do? Why, begin Masterstroke with the photos, of course. Which is exactly what she did. India Today solved a similar dilemma by simply splitting the screen and running the photos while T.M. Krishna held forth on his ‘anti-national’ views with Rajdeep Sardesai. The photographs had saved the news channels. All day, reporters, balanced precariously in speed boats with shaky cameras, were trying to capture footage of other speeding boats with the bridegroom and his baraat as it approached the wedding destination. ‘See, see!’ exclaimed the ABP reporter, ‘the baraatis are dancing in the boat’. Yes, we did see some shadowy figures bobbing up and down. Many exclamation marks later, we managed to see a parade of black umbrellas making their way up the hill: oh dear, was it the mafia? No, Ranveer & Co ‘had arrived’ at the wedding venue. This report is about the TV Report. Not about the event that was reported. Now we have reports on the reporting. New low in media standards.